Anti-Semitic graffiti was spray painted on an Oakland Jewish temple on Rosh Hashanah. Worshippers found the hate-filled obscenity — "F*** YOU JEWISH NAZIS" — and covered it with paper before the morning’s service, according to Temple Sinai Community’s Facebook page. City workers painted over the disturbing graffiti Thursday afternoon. “While this is surely upsetting, this will not define our experience of coming together as a community today. Our strength and resilience will sound through our voices in song and prayer,” Temple Sinai posted on its Facebook page. 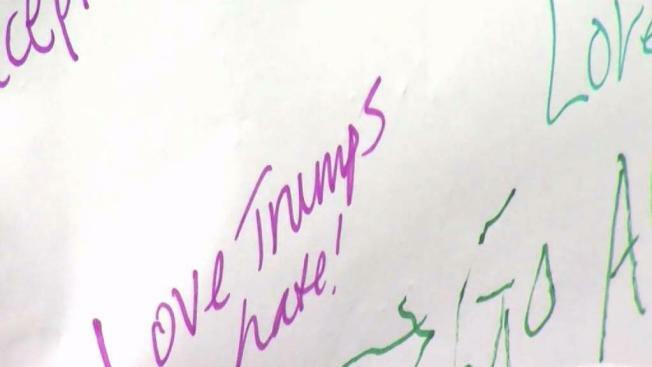 The Jewish community is celebrating its New Year and opted to respond to the slur with messages of love and friendship. 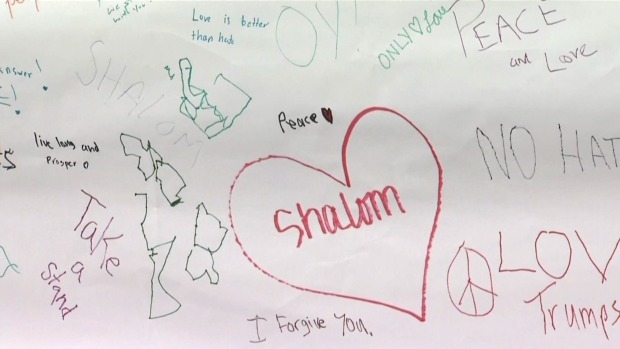 One person drew a heart and wrote "Shalom" in it, while others scribbled "Take a stand," "I forgive you," "Love is better than hate," and more. “May this be the year that peace come to our world,” Temple Sinai wrote on Facebook. Oakland police have been informed of the vandalism and additional officers have been stationed at the temple. Patrols in the area will also be stepped up. "Because this rises to the level of a hate crime, this is a felony," police spokeswoman Officer Johnna Watson said. "This is very serious, with serious jail time." Police also are looking through nearby surveillance video hoping to find clues. Last month, another synagogue, Temple Israel, was hit by vandals who threw rocks and shattered windows. A week later, Alameda residents found a number of hateful fliers left on the sidewalk. "I think it's become permissible that suddenly people feel like it's an OK thing to do and to say," said Jackie Mates-Muchin, rabbi at Temple Sinai. "I think those of us who think (it's not OK) need to work together and make sure our voices are louder."